"You know me. Never say die." "MM - discussed about Zero and got all clear to relaunch Zero! Massive shout out to the F4F MM Community who tirelessly pushed for this! Truly inspirational <3 span="">! No doubt in my mind that Zero would have been vaulted without you. Now it comes down to it - the ball was in my court, now it's back in yours - Zero will be relaunched and really hope that we get enough orders to go into production! #savef4fzero! If there is a fairy book ending to Zero, then that opens the door to more MM statues in the future! And I promise you this, my lovely MM F4F community - any future MM statues will truly be a collaborative experience - I would tirelessly work with you on all aspects of the designs to make sure that your feedback is heard and we can create perfect future MM products! GOOD LUCK Zero!" tl;dr Zero is alive again - however, everyone who pushed for it has to keep their word and pre-order when the time arrives (that's how I'm interpreting this, at least). I'll be sure to let you know when the statue relaunches. Hopefully we won't have to wait too long! Thanks to Nokynn for the tip! If only the same thing could happen to the Megaman games. In all honesty though, I'd rather save the D-arts line than this. I mean, is anyone ever going to fix the neck in this? And perfect future MM products?? You mean a series of Megaman X, First Armor X, Ultimate Armor X, Zero, Black Zero, classic Megaman annd MM Zero. Yeap, i said MM zero and that ends the line. If this statue was announced and saved as one of the first few ever Megaman X statues during the start of the series cancellation then it wouldn't be so bad. But right now, we have a plethora of choices when it comes to figure collecting and they are all based on the same characters all the time. At this point, they might as well do Body Pillow X and Zero. What's downright "terrible" about it? If it's the face everyone is complaining about, don't, because they've already said they're re-sculpting the face. The only other possibility that people are being negative are the arms and legs being a bit thin-looking. Other than that. I can't see how this is a "terrible" figure. The best Zero figure? Probably not, but still. again, getting less figure will not bring you any more games. f4f is not capcom, they're not deciding whether or not new games are made. if you're not interested in the figure, don't buy it, that's all. i'm not going to, but i'm glad the peoples interested in that figure can have it. I don't believe this, man I only want Zero to raise into MvC:Infinite, also f4f please at least color his neck dark grey. I'll never understand the fascination people have with f4f figures. Their Sonic stuff is usually subpar as heck (the classic Sonic statue they had was pretty bad looking) and this doesn't look any better, especially the head. But hey, if people want it and are willing to pay for it, then there's no reason NOT to uncancel it! Now if only this would happen with the games. I remember in the last article someone noting something about the "negativity of the Mega Man fanbase" or something along those lines. Yet here, it seems the fans have shown enough positivity and support to un-cancel this figure. It's why people really shouldn't let the few people who comment here, or any vocal minority for that matter, speak for or represent an entire fan base in their minds. You'll just end up hating literally all fan bases that way. I'm not sure if Capcom is the one restricting licensing for these figures, but can someone just pick up the license to make characters apart from main characters? No one asked to make super expensive statues of the same characters over and over again. Literally, Vile has only showed up in the D-arts Line with a Figuarts Zero Sigma. Why can't someone start a line with the main characters and then make the Maverick villains? Why does the MMZero line always start and end with Zero himself? What about 4 Guardians? I'm not trying to be negative for the sake of it. It's just I don't see the point in collecting the 16 million versions of Megaman X. I get it, these are the best figures we've ever had since the Mega Armor series back in the day and hence it's better than nothing. But we don't have nothing. We have so many figures of them from various companies now. But it's ever only covered the same characters. Whether or not capcom have to give agreement for each characters or just for a license, i don't think that's where the problem lie. it's just that a buisness have to stay carefull to make profit. even if the manufacturer are actually pasionate and not just in it for the money, they have to take that in consideration. While i would personally buy a good Vile figure (given it's not too painful for my budget), and i'd love figures of the 4 guardians, theses character are a more risky choice to make for a company. X, MMX Zero, MegaMan are the most popular characters, they are sure value and appeal to more or less all the megaman fandom. Vile would interested only MMX fan willing to buy a Vile figure, and the 4rth guardian will only appeal to fan of MMZ willing to buy a figure of them. That's why all the lines "stop" at MMZ Zero, contrary to what have became sort of a meme here, Zero don't kill the line, he just happen to be the only MMZ character with enough popularity to make the risk worth taking. i don't know if i'm being clear, but for short, figure is already a niche market, and megaman is a niche that will appeal only to MegaMan Fan (because let's face it, Mega is not as mainstream as he used to be, thank you capcom), and each individual serie will be a niche composed of the fan of this individual serie (because not all of us are fan enough of every serie to buy figure of it). and going into the fandom of any specific character would be one niche to much in this "nicheception". I think that's also where capcom's "no merch' before the serie hit 15th aniversary" rule came from. take ZX for exemple, it came out 10 years ago, which mean that someone who was 10 years old back then is now 20, in his early years of higher learning. People who where kids when MMX came out are now probably adult whith regular income and can afford spending in their passion. that said, even without going into expensive stuff, a serie of little collectible staring a large number of character would be great. Apparently they have "re-worked" the head, which has yet to be pictured, but the whole thing is just generally off to me; the limbs look too skinny and tubular, and the pose looks awkward. I hope this doesn't end up being another one of those cancelled projects which gets blamed on the fans and/or the characters, as I think this is genuinely just a bad sculpt (even if they fix the head/face), and that's the primary reason it did not do very well the first time around. F4F needs to up their quality control and get some real fans involved, as this isn't the first of their "premium" products which does not accurately/lovingly reflect the source material. I'm still not interested in this, and don't foresee a different head as something which will cause me to overlook all the other things I dislike about this sculpt. This is awesome! Insta-buy for me!! 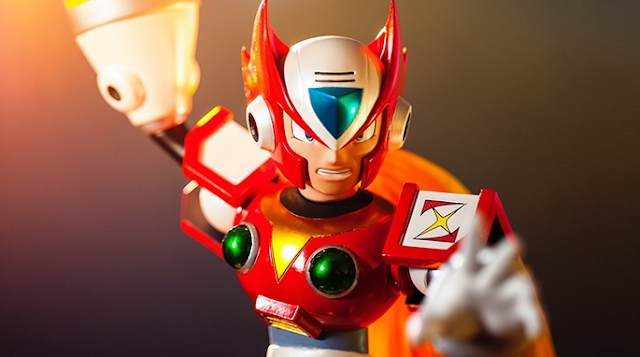 Zero came back from the dead, and now i come back from cancellation ! If only fan outcry could have saved worthwhile things like Megaman Universe. Still, it doesn't surprise me that this got uncancelled, they'd have to make it all the way to Megaman Zero before the whole line goes up in flames. That's the cardinal rule when it comes to Megaman figures and statues. well of course, saving a figure only need to bring them to give greenlit, saving MM universe or something? you'd need Capcom to actually get involved and spent their ressource on it. they're not doing that. Pfft. Typical Zero. Always coming back from the dead when people least suspect it! This ain't my cup o' tea, but I'm happy for those who wanted it! Ugh! Another one ? Very annoying figures action. Sighing. I'm glad that this figure isn't cancelled anymore. It looks great!